Savvy Spending: Free sample of Bandages from Children's Miracle Network! Free sample of Bandages from Children's Miracle Network! You can never have enough bandages! Am I right? 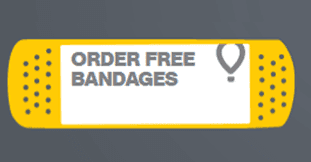 You can visit the Children’s Miracle Network site and click ‘Order Free Bandages’ to request a free Children’s Miracle Network Bandages sample! Please allow 10-14 days for your bandages to arrive. You'll also be opting in to receive the CMN Hospitals Newsletter emails and joining the movement to protect and heal kids by supporting children’s hospitals.